Over half the eligible male population of Australia enlisted during the First World War and of these some 295,000 served on the Western Front. Of those who served 46,000 died and 132,000 were injured. The First World War remains Australia’s costliest war with a staggering casualty rate of 65% killed or wounded–most of these casualties occurring on the Western Front. Many died in ferocious fighting undertaken on a previously unknown scale using weapons with an industrial capacity to take lives. Machine guns, massive artillery barrages, gas, tanks and aircraft contributed to the dreadful death toll. Even getting to the battlefield in Europe involved risks in moving across oceans where enemy submarines prowled and unseen mines took a dreadful toll on ships and life. Remembering the sacrifice of the Australians who died on the Western Front started before the war was finished, with men of the AIF building memorials to their fallen comrades on the Western Front battlefields. After the war the Australian Government built two memorials to commemorate the valour and sacrifice of the Australian Corps—the Australian National Memorial which was unveiled in Villers-Bretonneux, France in 1938, and the Australian War Memorial which opened in Canberra in 1941. 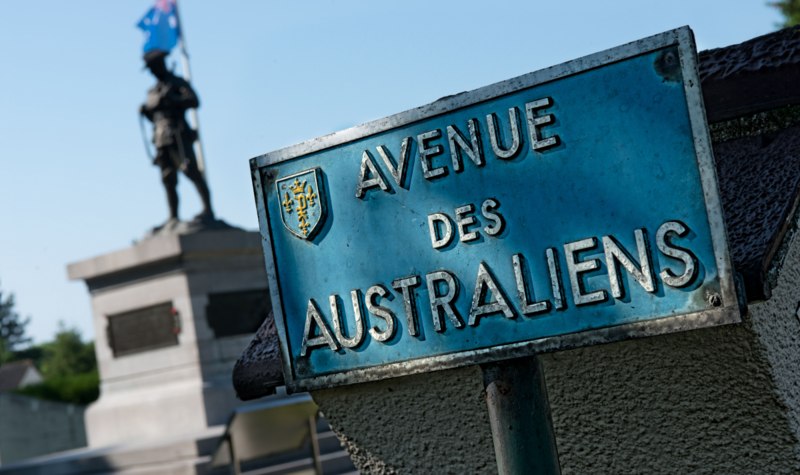 Memorials to each of the five Australian Divisions were also constructed on the battlegrounds of the Western Front, and now form part of the Australian Remembrance Trail. In Australia, remembering the fallen was marked by the proliferation of memorials throughout the country with obelisks becoming centre pieces of many town centres. The men and women who served on the Western Front had left offices, department stores, farms, mines, factories and fishing fleets across the country, with many never returning. A popular form of remembering them, and thanking those who returned, was in the construction of honour boards by various employers. One such honour board was the massive wooden board measuring nearly 3 metres by 3 metres placed prominently over the lifts in Boans Ltd department store in Perth. This honour board listed the 97 names of Boan employees who went to the war. Apart from 14 employees who were killed and many who were injured, a number of these employees returned to work at Boans where their names were displayed for Boans customers and workers to see. Books, films and documentaries were also created to keep the stories of our Anzacs alive in the Australian consciousness. Since the publication of C.E.W Beans official history series on the First World War a new generation of books have addressed nearly every aspect of the Australian experience of the Western Front. Books such as ‘The Lost Legions of Fromelles’, and ‘Pozieres the Anzac Story’, draw upon previously untapped archives and volumes of personal correspondence to explain the horror of battle. The TV mini-series ‘Anzacs’ and the movie ‘Beneath Hill 60’ also capture aspects of the Australian experience of the Western Front, with critical acclaim. Increasingly, Australians who travel to Europe are immersing themselves in Australia’s Western Front story by visiting sites along the Australian Remembrance Trail that links First World War sites of significance including museums, battlefields, memorials and cemeteries. Together, these films, books and sites help new generations understand the sacrifice of the original Anzacs and connect to Australian, and sometimes family history, in this centenary period of the First World War. The Boans Department Store Honour Board can be viewed at the Army Museum of Western Australia. Boans operated in Perth between 1895 to 1986. Peter Barton, The Lost Legions of Fromelles: The Mysteries Behind one of the Most Devastating Battles of the Great War, Allen & Unwin, Australia, 2014. Scott Bennett, Pozieres: The Anzac Story, Scribe, Australia, 2013.